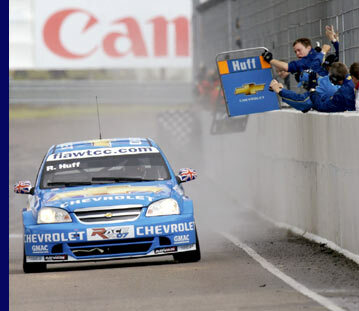 Chevrolet had another unforgettable day in the World Touring Car Championship, winning both races at the seventh venue of 2007. Rob Huff achieved a lights-to-flag victory in race one, with local hero Rickard Rydell, racing in a fourth Lacetti, claiming victory in race two ahead of Nicola Larini and Alain Menu, the second one-two-three of the season for Chevrolet. The Lacettis have now won five races this year. In the drivers championship, Nicola Larini is now fourth overall (and first among front-wheel drive cars) with 48 points, ten points off the lead. The two Anderstorp races were effected by the fast-changing weather conditions and difficult choices in terms of tyres and set-up. Both races started with a wet track that dried quickly during the course of the 13 laps. Race one saw Rob Huff fly away from the rest of the group in the wet. The Brit kept his cool when the track dried, clinching a well-deserved second WTCC victory. In race two, Larini and Menu started from the first row on rain tyres, and led almost until the end, but could not resist the come-back of Rickard Rydell, who was on slicks and much faster in the closing laps. I am of course absolutely delighted with the win in Race One. It was really the perfect race. Yesterday I said I wanted something in the middle between a wet and a dry race, and that’s exactly what we got. At the start, Monteiro went wide to fight with Nic, clearing the way for me. It was easy to pull away, as the car was handling perfectly in the wet. I just tried to stay focused and not to overdrive in order to preserve the tyres, as I knew I would need them when the track would start drying. The six second gap I could build up was clearly useful at the end of the race, but except for the three final corners, I did not feel much pressure from behind. In Race Two, I had a good start, could pass a couple of cars and run sixth for a while, but then my tyres got really bad and I simply tried to hold the guys behind me as much as I could to help my teammates in front." I took a good start in Race One, but lost the advantage of being in the first row when Monteiro pushed me almost off the track in the first corner, which left me in seventh position. Afterwards, it was difficult to maintain the pace, also because the tyres were not that great. I ran together with Rickard for most of the race, but in the closing laps it was difficult to resist the Seats and the Alfa. In Race Two, starting from the first row with Alain, I was able to take the lead and keep it almost until the end, although I was really struggled not to destroy the rain tyres in the dry track. I could hold Alain, but not Rickard, who was on slicks." Given my position on the grid for Race One, I took the risk of putting slicks on. It was hell for two thirds of the race, very slippery, but with the track dry I could go pretty fast, gaining ten seconds with respect to the gap I had after lap one and scoring also the fastest lap. Eighth position was a nice reward for the effort. In Race Two, I realized since the formation lap that it was a mistake to race on wet tyres. But all in all, I am satisfied with my results and it is an incredible week-end for the team. The two races were completely different for me. It was a little bit frustrating for me to finish ninth in the first race. I think I could have gone for Monteiro in the early laps, but I didn’t want to push too hard. Race Two was a different story. It paid off to take the risk of putting slicks on. In the early laps I was able not to loose too much time with respects to the guys on rain tyres, I think that is where I won the race. I am really happy to win at home and I thank Chevrolet and Eurosport for this great opportunity." Zandvoort, Pau, Porto and Anderstorp. Today’s result also shows how important it can be to have an additional car in the grid. We can only be very happy for the team and our brand. The next race of the 2007 World Touring Car Championship takes place in Oschersleben, Germany, on 2nd September.